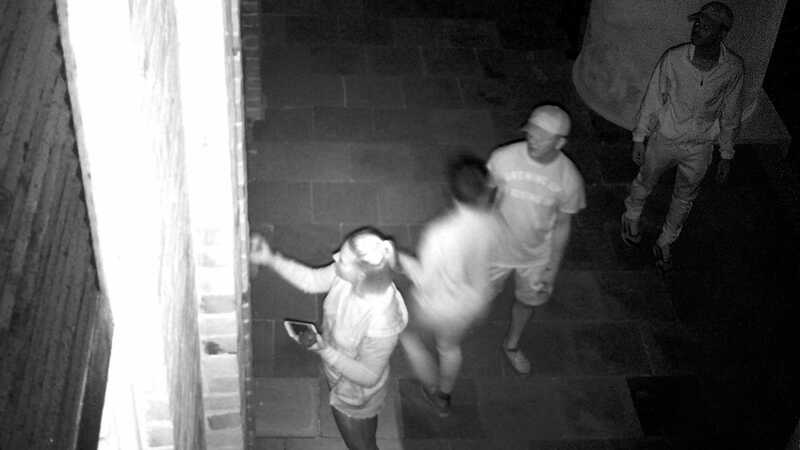 MAYESVILLE, S.C. — Four Air Force service members have been arrested after surveillance footage connected them to a recent act of vandalism at a historic South Carolina church. Kayla Eilerman, 18, Clayre Savage, 18, Daveion Green, 19, and Brandon Munoz, 20, are facing charges of malicious injury to a house of worship, conspiracy and trespassing surrounding the incident, which occurred late last month. They all are stationed at Shaw Air Force Base, approximately 25 miles away. According to reports, on Sept. 29, a member of Salem Black River Presbyterian Church in Mayesville called police after discovering that the church had been defaced with pentagrams, an upside-down cross and the word “Satan.” 20 spray-painted markings were found around the exterior of the church and two other buildings on the property. A door had also been kicked in. Police soon released images from the church’s security footage, which led to tips from the general public. The four were then arrested on Thursday and held on $15,000 bond at the Sumter-Lee Regional Detention Center. According to the Sumter Item, all four confessed to their part in the crime. The airmen have now been prohibited from leaving the base between the hours of 6 p.m. and 5 a.m., and face possible further disciplinary action. “This is a little small church out in the country that, quite frankly, is an older congregation and they were quite taken aback by some of this,” he said. Salem Black River Presbyterian Church was founded in 1759 by Scott-Irish settlers. It was listed in the National Register in 1978.